Background: As per the data available in the literature, a wide range of HER2neu protein expression in gastric and colorectal adenocarcinomas was reported in various studies world wide. Even though HER2neu over expression has a poor prognosis in these tumours, there is an increased demand for HER2neu study in the laboratories because of the availability of targeted therapy like Transtuzumab. Aim of the study was to determine the frequency of HER2neu protein overexpression in gastrointestinal adenocarcinomas. We studied innunohistochemical expression of HER2neu in a total of 71 cases of gastrointestinal adenocarcinomas. 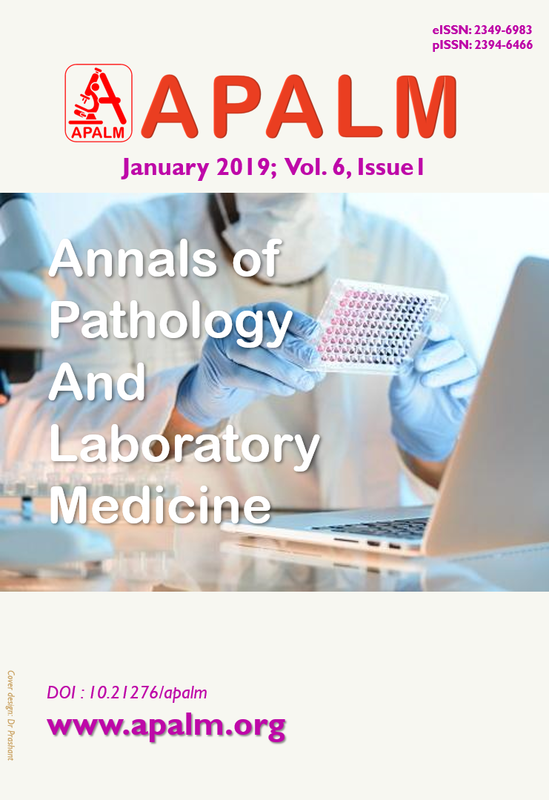 Methods: This was a prospective study done on 71 cases of gastrointestinal adenocarcinomas diagnosed in the pathology laboratory of a tertiary care hospital. Both small biopsies and resection specimens were included. Paraffin blocks and hematoxylin eosin stained sections of these cases were retrieved from the files. Sections were cut from the paraffin blocks and immunohistochemical staining for HER2/neu done. HER2/neu stained sections were examined and findings noted according to the guidelines for HER2neu reporting of gastric biopsies. Result: HER2/neu positivity (3+ score) on immunohistochemistry was seen in 8 out of 71 gastrointestinal adenocarcinomas (11.26%). HER2 positivity was 9.52% (4 out of 42 cases) in gastric adenocarcinomas and 10.2% (4 out of 39 cases) of colorectal adenocarcinomas. Conclusion: HER2 positivity was seen in a significant number of gastrointestinal adenocarcinomas tested, i.e. 9.52% of gastric adenocarcinomas and 10.2% of colorectal adenocarcinomas. Overall positivity in gastrointestinal carcinomas was 11.26%. Positivity was seen in cases reported on small biopsies. We did not attempt to study the correlation between HER2 positivity with clinicopathological findings because of the small number of cases studied. 1. Schuell B, Gruenberger T, Scheithauer W, Zielinski Ch, Wrba F. HER 2/neu protein expression in colorectal cancer. BMC Cancer 2006;6:123-127.